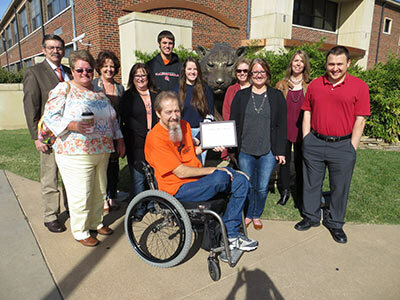 The Arkansas City Area Chamber of Commerce recently awarded Cowley College’s ACES (Academic Civic Engagement through Service) organization with the Open Arms Award. The quarterly recipients are eligible for the annual Open Arms of the Year Award, which is given at the chamber’s annual banquet. ACES works with many different agencies within the community and focuses not only on the service being delivered, but also the learning taking place. James Fry (pictured with award) serves as the coordinator for the ACES program.